PENTICTON, B.C. — A current player and a long-time contributor to the business of curling were honoured during the playoff weekend of the Scotties Tournament of Hearts at the South Okanagan Events Centre in Penticton, B.C. PENTICTON, B.C. 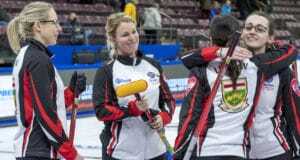 – Jennifer Jones has caught the other legendary Jones for the most Canadian women’s curling crowns. Jones captured her sixth Scotties Tournament of Hearts when Team Manitoba (Winnipeg) downed another Manitoban squad, Team Wild Card, 8-6. 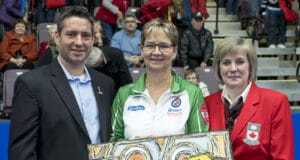 That ties her with renowned Nova Scotia skip Colleen Jones for the most Scotties titles. It was also the sixth for Jennifer Jones’s second, Jill Officer. However, it’s their first since 2015. Jones has also lost three finals. PENTICTON, B.C. – A team from Manitoba will win the 2018 Scotties Tournament of Hearts. All that’s left to determine is which one it will be. 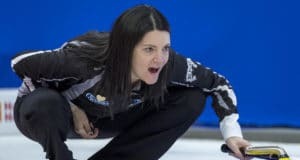 Team Wild Card, of East St. Paul, Man., skipped by Kerri Einarson defeated Mary-Anne Arsenault of Nova Scotia (Dartmouth) 12-9 in the semifinal this morning setting up a final against Manitoba’s Jennifer Jones later today (4 p.m., PT) at the South Okanagan Events Centre. Jennifer Jones moved to within one win of a record-tying sixth Scotties Tournament of Hearts championship with a crowd-pleasing, heart-stopping 9-7 win over Kerri Einarson and Team Wild Card in the Page Playoff 1-2 game Saturday evening. PENTICTON, B.C. – Mary-Anne Arsenault is two wins away from giving Nova Scotia, and herself, its first Scotties Tournament of Hearts title in 14 years. Nova Scotia (Dartmouth) defeated Northern Ontario (Sudbury) skipped by Tracy Fleury 6-2 Saturday to advance to the semifinal of the 2018 Scotties at the South Okanagan Events Centre. It was Nova Scotia’s ninth consecutive win after starting the week losing two of its first three games. 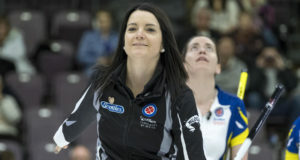 Kerri Einarson and her Wild Card team continued their run through the Scotties Tournament of Hearts Friday, beating Casey Scheidegger of Alberta 7-4 to finish first in the standings and secure their spot in Saturday’s Page Playoff 1-2 game. PENTICTON, B.C. – Mary-Anne Arsenault has been keeping her family, friends and ex-teammates up late at night in Nova Scotia this week. But they don’t mind as long as she keeps winning. And she is. Boy, is she. PENTICTON, B.C. – After being on the outside looking in, Sylvie Robichaud and her New Brunswick team showed they were the best of the rest. 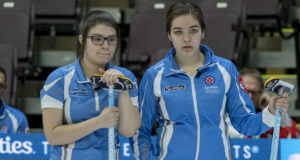 New Brunswick (Moncton) downed Newfoundland/Labrador, skipped by Stacie Curtis, 8-4, Friday morning to finish ninth at the 2018 Scotties Tournament of Hearts at the South Okanagan Events Centre. PENTICTON, B.C. – A week ago Kerri Einarson arrived at the 2018 Scotties Tournament of Hearts trying to get a ticket to the rock party. Now she and her Team Wild Card (East St. Paul, Man.) have moved to the head of the line. Casey Scheidegger of Alberta and Kerri Einarson’s Team Wild Card used three enders in the middle of their games to score tight victories Thursday afternoon as the Championship Pool got underway at the Scotties Tournament of Hearts. PENTICTON, B.C. – Ontario survived an emotional amusement park ride to play another two games today. Skip Hollie Duncan’s squad outlasted Newfoundland/Labrador’s Stacie Curtis (St. John’s) 11-8 in a tiebreaker game at the South Okanagan Events Centre Thursday morning to advance to the Championship Pool of the 2018 Scotties Tournament of Hearts. 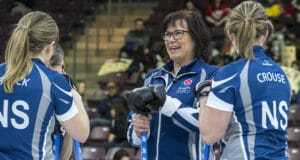 Tracy Fleury’s last-rock, tap back to score a single in the 10th end gave her Northern Ontario team a critical 7-6 win over Kerry Galusha of the Northwest Territories Wednesday evening, propelling Fleury and her teammates into the Championship Pool at the 2018 Scotties Tournament of Hearts in Penticton, B.C..
PENTICTON, B.C. – British Columbia might have played the gracious hosts losing two of its first three games but Kesa Van Osch’s Nanaimo curling crew roared back to secure a spot in the Championship Pool of the 2018 Scotties Tournament of Hearts. Mary-Anne Arsenault of Nova Scotia kept alive her hopes of advancing into the Championship Pool at the Scotties Tournament of Hearts with a patient and rewarding 8-2 win Wednesday morning over Chelsea Duncan of the Yukon. PENTICTON, B.C. – Two teams took a big step up as a team of teenagers created chaos in Pool B action on Tuesday night.